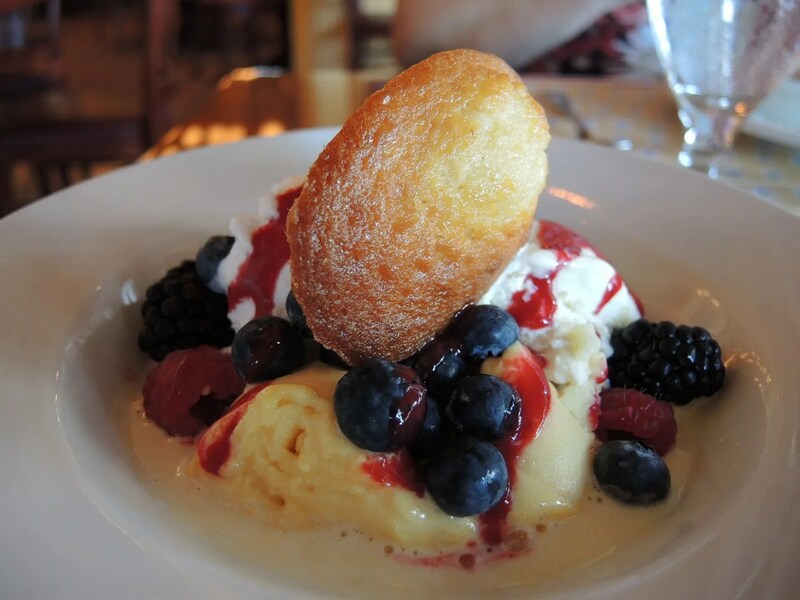 After our breakfast at Wilderness Lodge, we headed to Epcot where Brenda, Emily, and I had lunch at Chefs de France. 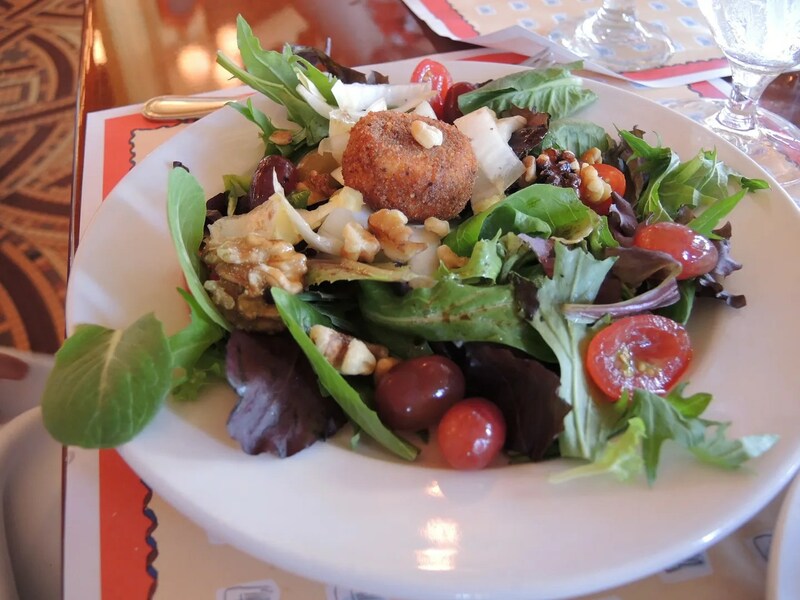 This lunch was booked with the Candlelight Processional (CP) Dining Package. We booked a 2pm lunch for the 5pm Candlelight Processional show featuring Whoopie Goldberg as the narrator. The Candlelight Processional dining packages allow you to enjoy a meal at one of Epcot’s restaurants, while guaranteeing you a seat for the Candlelight Processional show. It’s important to note that at times this is THE only way to get a seat. Those with Dinner Packages are the first to be seated – those waiting in line (a.k.a. those who didn’t buy the package) will be given the very few seats that remain. And if you’re at Disney World during the holidays the Candlelight Processional show is a “Don’t Miss” event. Our lunch package included a choice of appetizer, entree, dessert, and a non-alcoholic, non-specialty beverage from their regular lunch menu. 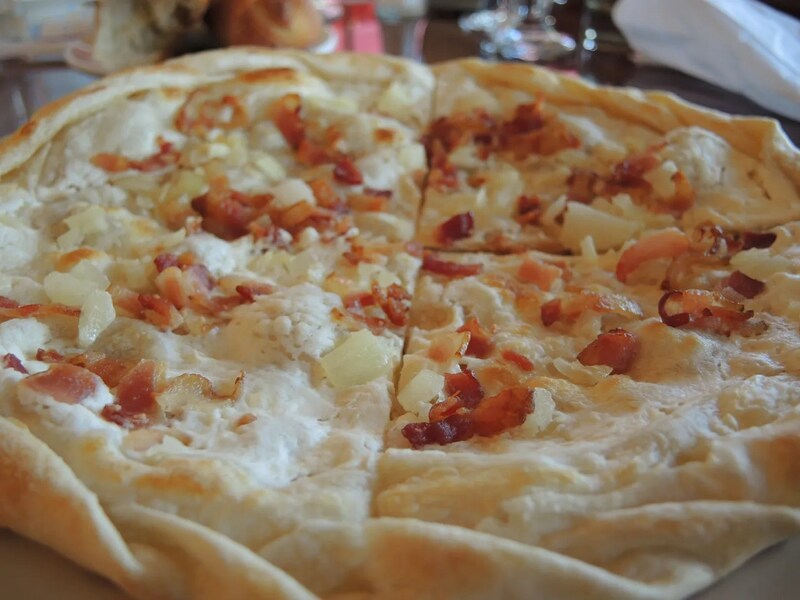 For their appetizers, Emily chose the salade de chevre chaud while Brenda had the bacon and onion flatbread. 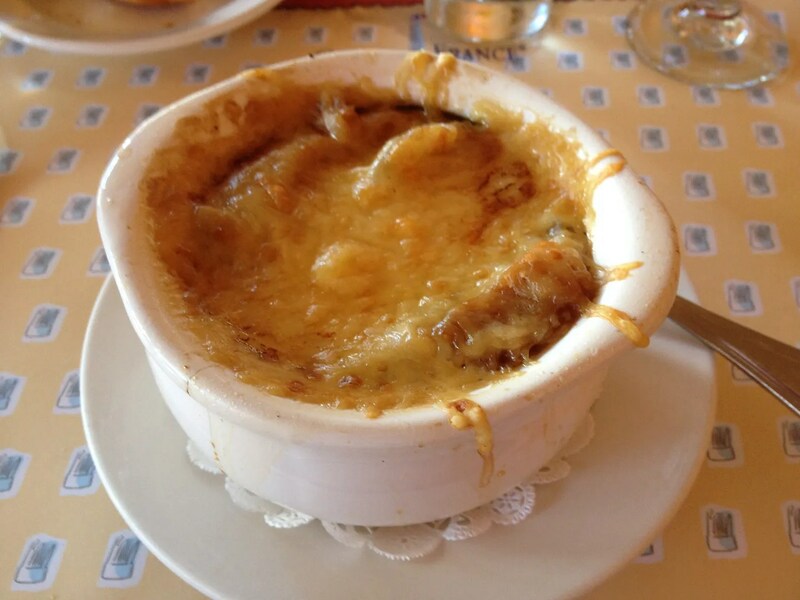 This was topped with a generous amount of delicious gruyere cheese…which I ate every bit of, as it is my favorite part of this soup. The broth, while not quite as flavorful and as the one at Shula’s (my current favorite French Onion soup on Disney property) was good. Note: I believe that a chicken broth is used here, while Shula’s has a beef broth (which I prefer). Anyway, I ate about half of it, wanting to save room for the next two courses. Emily said this was ok, not anything amazing but it was worth trying something new. The mixed green salad that accompanied the sandwich went untouched since she’d just eaten the delicious appetizer salad. Remembering that I planned (hoped) to order a 3 course meal for our dinner that night, I decided that I should steer away from all of the pasta dishes. Although I love pasta, I always feel very full for a long time after eating it. So this eliminated not only the mac & cheese that I originally intended to try here, but also the vegetarian lasagna and the short rib dish. 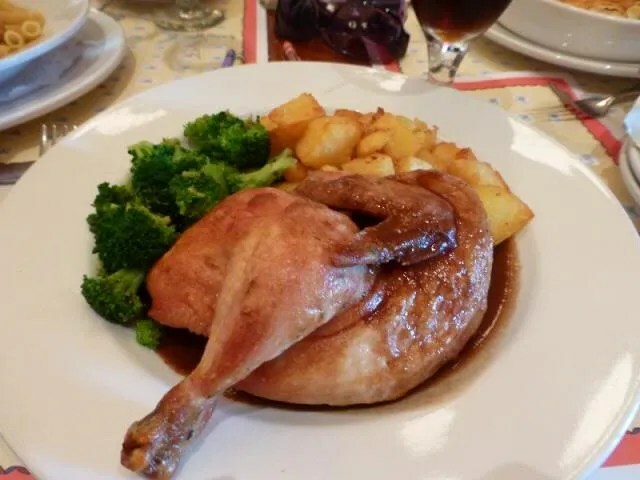 Knowing my daughter’s very negative opinion of the roasted chicken entree that she had tried during our last visit to Chefs de France, I immediately discarded that option. I wanted something a little more “French” than a hamburger so crossed that off the list of possibilities. Also I had satisfied my craving for quiche the day before at the bakery, so the quiche was out too. 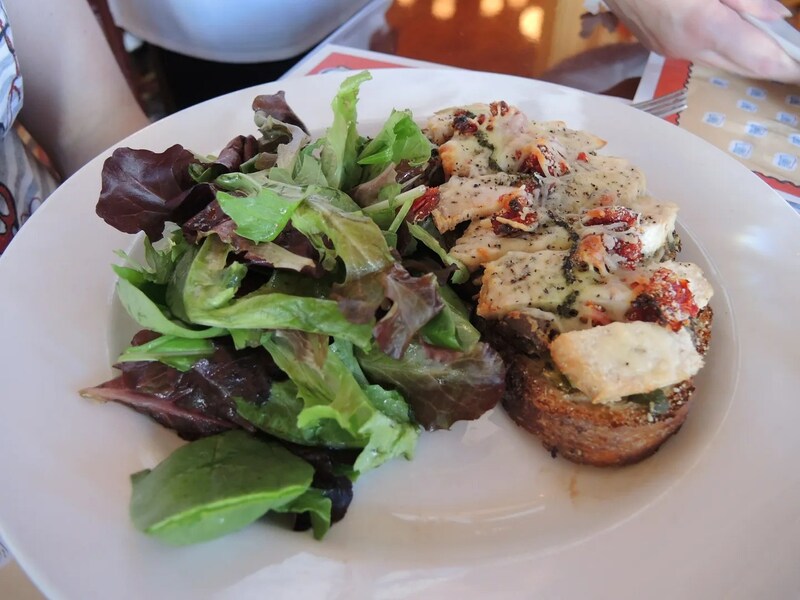 That left four options…the mahi mahi sandwich, salmon, open-faced chicken sandwich, and the Croque Monseiur. After further consideration, I decided I wasn’t feeling like fish that day. So then there were two. And what was the scientific method which I used to make my final decision? It was about this time that Em said she was going to order the chicken sandwich. So I let go of that poor tiger’s toe before it hollered and “definitively” announced (or so I thought anyway ) to our server that I wanted the Croque Monsieur…merely for the sake of ordering something different than my dining companions. Well, either I butchered the pronunciation or he was reading my mind and saw “chicken” still there because that is what I got. Only it was not the chicken sandwich that was set before me by a food runner (if it had been, I would have been ok with keeping it). Btw, this photo is borrowed from the internet, as this did not stick around long enough for me to think about photographing it. 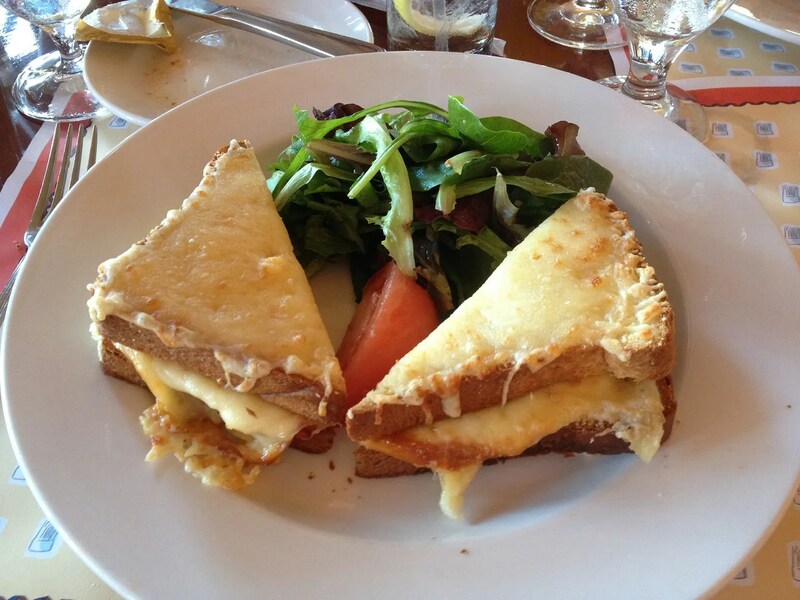 Croque monsieur et salade verte – The classic French toasted ham and cheese sandwich, served with a green salad. Here is when I admit that I had never before tried a Croque Monsieur. In case you too are unfamiliar with this classic French sandwich, it consists of two slices of thick bread topped with bechamel sauce, thin sliced ham and gruyere cheese. It is then sprinkled with more shredded cheese on the outside…again gruyere, and I think maybe provolone and parmesan too. The sandwich is then toasted until all of that yummy cheese is melted. Sounds delicious, right? Well, I think I was expecting something along the lines of a Monte Cristo (which I love), so I would have to say that I was a little disappointed with this. I liked it but didn’t love it. And I guess this is my common theme for this meal, because again with my dessert choice, I liked it but didn’t love it. I was originally planning to order the profiteroles, but before ordering dessert I was already “comfortably” full. I knew that if I ordered the profiteroles, I wouldn’t be able to stop myself from eating the entire dessert and crossing over the line into “uncomfortableness”. Although I love creme brulee, I remembered that Chef’s version didn’t “wow” me before so I thought this was a safer choice. 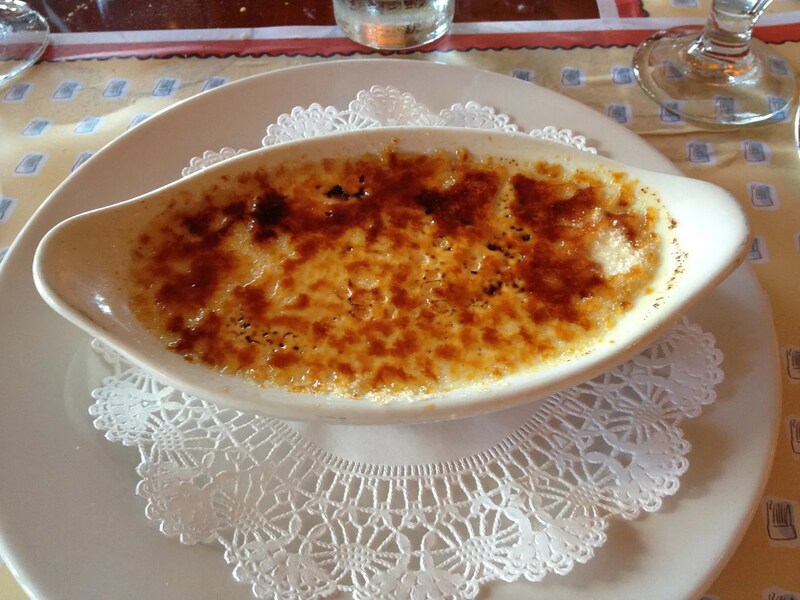 My memory served me well and the creme brulee was just as I’d remembered…good, not great.